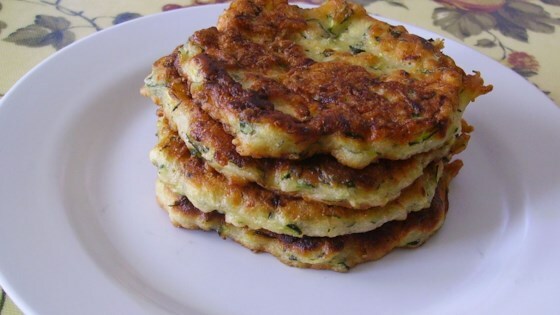 "An old-fashioned Italian zucchini fritter!" Beat the eggs in a mixing bowl with a wire whisk until smooth. Stir in the shredded and diced zucchini, then season with salt, pepper, Parmesan cheese, and basil. Add the flour a little at a time, stirring between additions until no dry lumps remain. Heat the oil in a large skillet to 375 degrees F (190 degrees C). Drop the batter into the hot oil by the spoonful a few at a time making sure not to overcrowd the oil. Cook until the fritters are golden brown on each side, about 4 minutes. Drain on a paper towel-lined plate before serving.